VXP Redline White Heat Review – Does it work? Choosing the right pre-workout supplement is always a battle of balance. With all the stimulants, energy boosters, and nootropics added to the mix, it’s hard to find that one product that would fit your needs perfectly. It’s good that most pre-workout supplements do something to improve your performance during workouts. However, it’s important to weigh benefits against potential side effects. VXP Sports Redline White Heat is a potent pre-workout supplement that promises to improve your energy, stamina, and focus during workouts. With a stimulant-heavy formula that promises to provide energy even to the heaviest of stimulant users, Redline White Heat simply isn’t for the faint of heart – literally. Its single-serve of 1 scoop contains about the caffeine equivalent of 5 cups of coffee, and if you have a heart condition, you might want to have yourself cleared by your physician before taking anything as strong as Redline White Heat. When taking stimulant-heavy formulas like Redline White Heat, you would need to review the formulation of every supplement that you stack it with. The caffeine content of Redline White Heat is no joke. At 400mg, it can cause serious palpitation, hypertension, and sleeplessness. Check your other supplements for stimulant ingredients. If possible, avoid other supplements that contain stimulants when taking Redline White Heat. 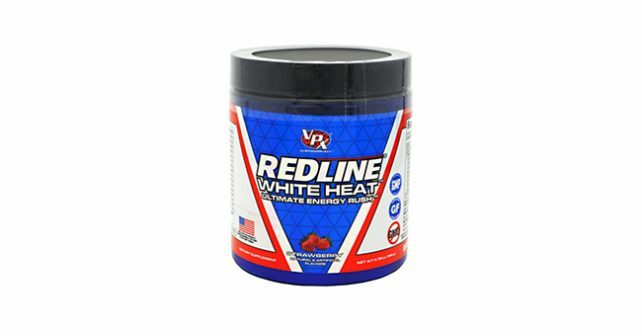 Redline White Heat isn’t your regular pre-workout supplement. It’s typically favored by advanced bodybuilders and endurance athletes who have gained a resistance to stimulants over years of stimulant use. Due to its borderline dangerous nature, it’s not advisable for newbies to use Redline White Heat. Gauge your tolerance by taking half a scoop, then move up to ¾ scoop and 1 full scoop depending on your comfort level. We collected information about Redline White Heat. We found out that apart from its 400mg caffeine content, it also contains a myriad of other ingredients that assist in workout performance. It contains 3 different kinds of Yohimbe, a vasodilator that increases blood flow to the muscles. It doesn’t contain any other Nitric Oxide boosters to improve blood flow. At the concentration levels of Redline White Heat, you can stack it with other Nitric Oxide boosters provided that it doesn’t contain other stimulants. Redline White Heat is found to contain a banned substance known as DMBA, which is structurally identical to DMAA and Ephedrine, which are also banned by the FDA. DMBA mimics the effects of amphetamines, and while it wouldn’t be a problem in drug tests, it would seriously create a problem with long-term use. The formula contains high levels of caffeine, yohimbe, and DMBA. When stacked, these ingredients amplify the side effects which include serious palpitations and flu-like symptoms. Redline White Heat is reasonably priced at less than a dollar per serving. Compared with other pre-workout supplements, it’s relatively cheaper, especially when you reduce your servings based on your tolerance level. Users of Redline White Heat are particularly concerned about the inclusion of DMBA, which is not declared in its supplement profile. Those who have used the product complain about the side effects of Redline White Heat, which last until the next day. The real question is, how far would you go to improve your performance? There’s no question that Redline White Heat can be an asset to enhancing your workout performance, but there should be a balance between results and risks, and unfortunately for this product, the reward doesn’t seem to justify the means. The best supplements for muscle gain usually come in stacks. For fast and easy muscle development, use NitroGenix 365 with Deer Antler Maximum Strength. It combines the strength and recovery you get from better blood flow, with the benefit of IGF-1 in Deer Antler Velvet. Check it out.